Our cat Frank died around Thanksgiving of last year of FIP, leaving his sister Emmy a little lonely. A few weeks ago we got another cat to keep Emmy company. This new kitten is only around 10 months old, and he’ll run around and chase anything. His air time and somersaults can be quite impressive, so I wanted to get a new video camera to record some of his antics before he gets older and slower. Geez, it’s 2006 for pete’s sake–why should I be pulling tapes in and out of what is (for the most part) a computer? For a long time, I burned data onto CDs or DVDs or tapes. If you do that, you’re always looking for a pen or a label, or trying to find the right CD. Eventually I saw the light. The light is: digital storage is the only way to go. Hard-drives or (worst case) memory cards are so much easier. And they’re cheap. I saw a 200G hard drive for $82 earlier today. So this afternoon I ducked over to Best Buy and picked up a GZ-MG37US. It’s got a 30GB internal hard drive. I’ll let you know how it works. The Sony HDR-HC3 looked really sharp (it records at HD resolution instead of standard), but can you guess the output format: tape. I have a VHS tape I’ve been meaning to convert to DVD or MPEG for six years. Heck, I’ve got a D1 tape from grad school days and I have *no idea* how I’m going to convert that to something sane. So I’m voting with my checkbook: no more tape for me. Tapes? Is that something the dinasours used? Man, I had this problem when I was trying to buy a camera – it’s so hard to find something decent that doesn’t still run on tape. I wish they’d hurry up and put decent hard drives in everything and whack USB2 ports on the end… It would make life to much easier. It’s a strange transitional time in the camcorder world at the moment. I love the idea of a hard drive recorder but not until they can record in the DV-AVI format. The problem with the current crop of hard drive recorders is that they save the video in a lossy format of MPEG-2. The max bitrate of your particular camera is 8.5 Mbps which is very close to AVI quality but not quite. While DV-AVI tape does employ some compression it is considered lossless. If properly stored will last a very long time. When viewed on a normal TV it’s difficult to see any differences. However on a large HDTV the difference becomes more noticeable. I was watching Lord Of The Ring at Circuit City on some large HDTV and I could see MPEG artrifacting and blocking. In defense of “tape” one of the highest quality formats is VHS…well D-VHS. Don’t even get me going on the massive 18 minutes of recording time with a DVD camcorder. I would say that the Sony HDR-HC3 is one of the better future proof cameras you could buy at the moment. There are very few software editing programs/hardware out there that can handle HD editing but here will be more in the future. To quickly conver that VHS tape of yours one of the best bets is a DVD recorder like the JVC DRM100S or the Toshiba D-R4. 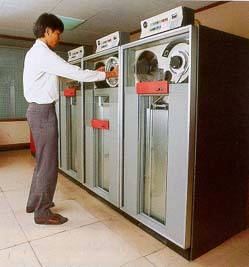 These particular units have circuits to help filter and actually improve the quality of the VHS tape. One of the biggest problems with the cameras with a hard drive, is archival. If you go away on vacation and shoot a lot of footage. What are you going to do with it when you get back? Well, you are going to dump it on your computer and edit the footage. then you are goign to burn a dvd. How are you going to archive that raw footage? Chances are, your not. You are going to feel that your finished product is all that you need and you will dump your footage to be gone forever. Tape still provides the best archive for video..
You can plug the camera into your laptop via firewire, edit it with a DV edit tool without loss of quality and then burn it to dvd’s. Each 60min DV tape can hold up to 13 gigabytes of data. The DVD/memory card-recording cameras use mpeg compression – you will have to decompress the video-stream if you want to edit it. And there is no way to get the raw video from a dvd camera. Another vote for tape here. Simply better quality video at the moment. Btw, how is it going with Emmy herself? Are you talking external or internal HDs, Matt (I’m assuming external)? If so, you may want to do what one of my best friends does: he gets a case of them (I think there are 8 to the case) and splits the cost among himself and whatever friends want them. Then, he burns his stuff onto the externals and goes from there. He picked up 3 200 GB externals for a bit over $200 CDN doing it that way. I just got the exact same camera! I haven’t even had a chance to try it out yet. All I’ve done with it so far is plug it in and charge the battery. I’ll be interested to read what you think about it and the editing software it came with. Be sure to post a short clip of the new cat on Google Video. I’ve got a parallel problem with my old Ensoniq ESQ-1synth. It has 8-bit sound that I really love — and I can’t reproduce it on modern keyboards. The only interface Ensoniq offered for data storage back then (1989) was on analog casette tape, and not even on the big, really floppy disks – remember them? I think I need some heavy-duty hardware changes on the synth so I can just store and retrieve data in a 21st century way. My data cassette collection is looking a bit scary 17 years later. Well, it is right about CD dvd tapes cdr , I moved all data to HD… was all of this a Good opening conversation for the need of a GDrive ? a Gdrive searchable Accessible (+ mobile), or why not accessible by VOICE COMMANDS. I am not trying to build the Gdrive business model, but it is trully the Future. Thanks Matt, and this is a real need for everyone. Tedster, you might want to try replacing/extending the tape input with a line-in/out jack. After all, it doesn’t really matter on which media the sounds are stored as long as it can be reproduced in a sufficient quality. Which any half-decent MP3 recording stick should manage. I’ve personally seen this on a C64 datasette drive which has been MP3-stick-transmogrified, it should be possible on any cassette tape driven interface. I’m pretty sure that if I buy a new HD gizmo that Blue Ray will win the brewing format war. As I recall Beta Max was better than VHS, it’s just that VHS video won. Or am I being controversial with comments like that? Funny you say this.. i purchased a camera a year ago.. same faults and problems.. i have to set up a VCR to root throughmy computer to capture! its a nightmare… actually given up some what now! I would have gone for tape DV or the HD versions thers a cute HD/widscreen sony cam that is very desireable and only a couple of grand. Tape does have some advantages orver DASD. Sound on Sound had an interview with a guy who had worked with pink floyd and they recorded a load of shows to Harddisk – put them on a shelf for several years and cound not retrive the data when they wanted to – the bearings had seized. It’s Robin from PubCon – hehe, I love that you just posted about my area of expertise! We’ve reviewed both of the MG37 and the HC3 hands on and done extensive tests with them. While I understand what you’re saying about not wanting a format that is going to get replaced, the reality is that the video quality of hard drive as well as flash media based camcorders is no where close to the quality of their tape counterparts. Shoot with the MG37 for a few days and you’ll see what I mean – especially if you take some indoors or low light shots. It’s going to look horrible – absolutely horrible. Both our reviews are on the front page so you can compare the test pics. Also, the hard drive camcorders have to go through an obscene amount of compression to fit the video. Their highest quality settings are 8 Mbs vs. 25 Mbs of the HDV HC3 that you’re talking about. If you really really want a camcorder that is “future” proof and doesn’t use tape media I’d strongly recommend the Panasonic SDR-S100. It’s video quality isn’t near the HC3 but it is okay because it uses a 3 CCD system. It’s a little hard to find but it’s way way better than the MG37. The reality is that tapes are going to probably be here for 5-7 years because at this point, with the amount of data that is in a video signal, it’s completely impractical to save that to a memory card or a hard drive with on the fly compression. The best hope is going to be Blu-Ray or HD-DVD format camcorders. On top of all this, the reason that media makes so much sense for video is because of archiving. Less so than with pictures, people like to take a video and then put it in their closet and not look at it for a few years. They take a lot of these so called “archived” videos. While with a digital photograph, it’s easy to archive because you can just store them on a hard drive (which is pretty cheap). For video, an hour’s worth of good quality video is going to take 11 GB! So archiving digitally is much more difficult. It’s the same reason that tape backup made so much sense for so many years. The alternative of this is DVD camcorders, which can get backed up pretty easily by just putting the DVD disc away. The problem with a hard drive is once it’s filled up with video you have to dump it off, and most consumers (95%) never hook their camcorder up to their computer to do that dumping off. Frankly, it seems quite unlikely, until 20GB SD cards go for $10, that we’ll see truly tapeless camcorders. It’s only going to get worse with the blu-ray/hd-dvd war coming up as well. I think that in most cases, what you want to do with a DV camera, for instance, that’s recording onto tape media, is leave the tape in the camera, hook up the DV/firewire cable to your computer or DVD-R (my cheap, cheap Target $99 DVD-R has a DV-in hookup on the front panel) and pull the data off in that manner. The tape is just the intermediate storage, until you pull the data off onto your computer or burn to DVD. Tape is nice, though – as others have said, for when you’re on vacation, you can easily put together a few tapes worth of material – whereas with the internal HD, you’ll either need to curtail your recording or pull off the data. I’d also be concerned about the moving parts in a typical internal hard drive, versus a tape drive – seems like having something spinning at 5400 RPM or so while you’re moving/walking/running/tripping might not be the best thing!! http://www.physorg.com/news65093972.html – I saw this article and thought of your problem. HD broadcast quality, flash and REV pro storage options, mpeg2, and more input and output options than you can handle. It’s a steal at just under $20,000. Flash is definitely the storage medium of the future. It will be just as cheap per gigabyte as any other medium, with the best densities besides like holographic storage, which won’t be showing in plastic any time soon. I would also be intrested in the name of the new kitten in the Matt Cutts family ? >>>>> so I wanted to get a new video camera to record some of his antics before he gets older and slower. He he – some (most) cats never stop being a kitten (sp?) – I bet Emmy can give the new kitten a run for its money. Shes still Emmy from the Block. She used to be a kitten, now is a little cat. But she knows where she came from…….Mountain View ? Mo, fair point. 🙂 Even hard drives have their faults. It’s just annoying to me that no one has solved this problem well. Hawaii SEO, I like how little and light the Everio is. We’ll see how the quality looks. Shoemoney, what do you use for your video stuff? One of my Cats is called Binky – after Deaths horse in Discworld – which we know (cough cough) Googlers are often fans of. Good name for a cat too. what do film producers use to store their data when making movies? The next evolution will either be bringing the good stuff to home video.. or going in the ipod direction with camcorders. Why not have a camcorder size device loaded with flash memory and a USB plug? Then you just load up your imovies software and you’re good to go. I use a tape based Sony handicam at home shooting in MiniDV. The tapes are small, last an hour and are perfect for archival. As others have mentioned, archival is important. I rarely ever copy over anything I have shot because tape is cheap. I also prefer MiniDV because of the quality you are getting. MPEG-2 does compress better, but the quality tradeoff can be an issue. As well, decent MPEG-2 editors are somewhat lacking unless you have some bucks to through at it. As far as a lossless compression format for video… you need to keep in mind the bandwidth required for it. The bandwidth required for video is significantly greater than an audio file. Mp3 is not a lossless compression format. It is lossy, meaning that it discards pieces of the audio signal which are “considered to be less important to human hearing”. I definately agree that cameras need to go to disk, although I prefer memory cards, as they are more flexible for vacations and such. My brother-in-law just picked up the Sanyo VPC-HD1, stores on SD cards, records in 720P HD resolution, and uses MPEG-4, and also acts as a digital camera. For it, and a few memory cards, you’re looking at $1500, with half of that being a couple 4GB SD cards, and I think this will become a much more inviting option as SD and other memory cards drop in price. Of course, now I’m jealous as I still work with tape, and have around 40 hours I need to convert to digital, but I just can’t muster up the energy to sit through all the transfer. I’d love to hear your feedback on your new camcorder. I’ve been considering purchasing one of those exact same JVC camcorders, but heard bad things about the image quality. Hard drives are definitely the way to go…forget tapes and other obscure formats that will be obsolete in a couple years. Recording for hours on end is a huge advantage…keep us posted! wow, mike you need a day job. Camera & Video Camera in one. I came back home in Boston showing it off had to send 2 back to the States already by request from family members. Size is about close to a US cell phone. I usually travel around Tokyo with it in my back pocket!!! Now that makes perfect sense. Why ever use a HD when there are DVD’s (and cheap too)? You refer to tapes as if they’re analog. Some are, but my video camera uses MiniDV tapes, which are digital. So video cameras agree with you. “The light is: digital storage is the only way to go.” I agree. But that doesn’t necessarily mean ‘no tapes.’ Tapes work very well for me. Why? To name a few reasons: reliability, durability, storage, and compatibility. Tapes tend to not be as sensitive to being dropped or exposed to magnetic fields. They store tons of data at a low cost. And it’s compatible with older formats such as 8mm, whose analog tapes are the same size as today’s digital ones. Don’t all DVD camcorders record on those mini DVD’s that hold about 1 Gig of Data ? That’s only good for about 20 minutes of MPEG2 footage. I lke the idea of flash storage. I recently saw 1G cards for about $20 online. I agree, plus CD-DVD media is so easy to f’ up. I like the pictures of next gen dvds that have a shuttle around them. That camcorder is pretty slick. Most RW disks hold 1.4GB and do away with the need to use a PC as a intermediatry object. Elliot, fair points, but with tape you also have to hook your video camera up to the computer and *play the tape* to transfer it. I’d rather just move files around on a virtual hard drive, with the option to dump data to tape if you want to. Olney, I thought about getting an Xacti. Looked as if it would be hard to hold still though. Seems like the Sanyo/Fisher ones were a little unsteady in the picture. It’s about $1,400 and should be available in a few months. Ya you are right the tapes age is over! Now the new one is iPod and Mp3s. No more tapes. I had a box of cassettes that were never played for about 10 years. They were all garbled when I tried to play them. HP tapes was a good idea. Again, it’s a tape meaning it cannot be stored forever. Tapes will eventually become obsolete one of these days. Just curious why poeple still use tape for storage. Yeh I hate media to. I mean just take a look at dvd movies. Which I thought was a great invention but now we got hd-dvd and blue ray. But the prices also get ridiculous as well. I guess technology has moved leaps the last 5 years.